Infectonator got me quick. Sitting next to my 2 year old daughter while she had a bath, I turned on my phone wanting to delete some apps and clean up a bit. 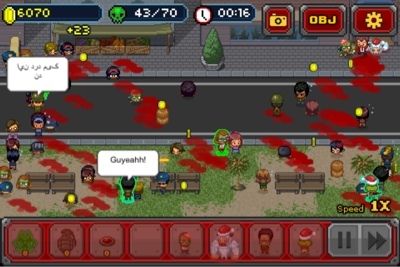 I stumbled upon Infectonator and decided to give it a chance before I deleted it. I remember the only reason I downloaded it was because of the pixel zombies - I thought they looked pretty darn good. Little did I know the blood bath that I was in for. Goal: infect or kill citizens. That's right, it's not just infecting you can also "support" meaning to throw in an exploding barrel of infectious slime or a grenade and land mines. This game is so violent (achievements for killing police, blood smeared asphalt) and death and carnage all over - it would have been banned in the years of the SNES - and now it's on your friendly App Store! The more you kill the more gold you can collect to upgrade your zombies and unlock new ones. Oh and the graphics are rally great, the people and the world looks a little generic but the zombies are cool and when the fighting starts its fun to sit back and smile with schadenfreude. Another fun detail is the speech bubbles that pop-up in the crowds, in the language of that city - I only understand the French and German but they were pretty funny. But hey Altec, it's just a trick! There's IAP and the world map you like it's just a variant of the level selector you so much hate! Yes and no.... The IAP is never really present, only of you try to access it and the game is definitely beatable without using it. The map-level-selector I think is forgivable because thy tried something different and it fits well to the style - they could have just make a list of the levels on little squares with a star rating under it like all those ugly games but they didn't. Sure, at its core your just dropping units in and watching them randomly attack or die, but somehow the gore and the madness make it worth it. It's a mobile game for short breaks but as I found over the day I started playing - you'll be through in 2 hours and on your 2nd play through before you know it.